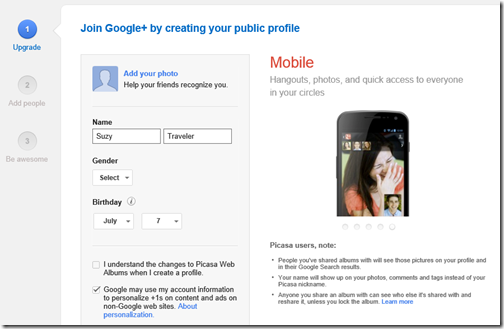 Google Plus – Learn Picasa and Google Photos! Change is hard. Those of us who have been using Picasa Web Albums for years, to share our pictures on the web, didn’t like that Google is changing to Google+ Photos and leaving Picasa Web Albums (PWA) behind. At first, the Google+ picture display fanned out your pictures in each album like cards fanned out in your hand. I found that to be annoying. They don’t do that anymore. There were several features in Picasa Web Albums that were initially missing from Google+, like slideshows, and downloading albums. Google+ is catching up, those 2 missing features are there now. For the few features that are still missing, it’s easy to go to Picasa Web Albums and use them there. What I really love about Google+ Photos now is the way it displays my pictures. It fills the screen with just my photos. And it automatically enhances them. Once in a while, I go to Picasa Web Albums and the display makes my pictures look old and plain by comparison. Here’s a sample of the pictures from my most recent album – shown with Google+ Photos. I’m not saying that the confusion is gone. There’s still a lot to learn when it comes to sharing with Google+, but you can still just share with a link like we’ve always done with PWA. See this past article on What Happened to Picasa Web Albums. But, if you tried it before and didn’t like how it handled your pictures, it’s time to give it a second chance. Whenever you log in to your Google account, you probably see this screen (below) where you can join Google+. 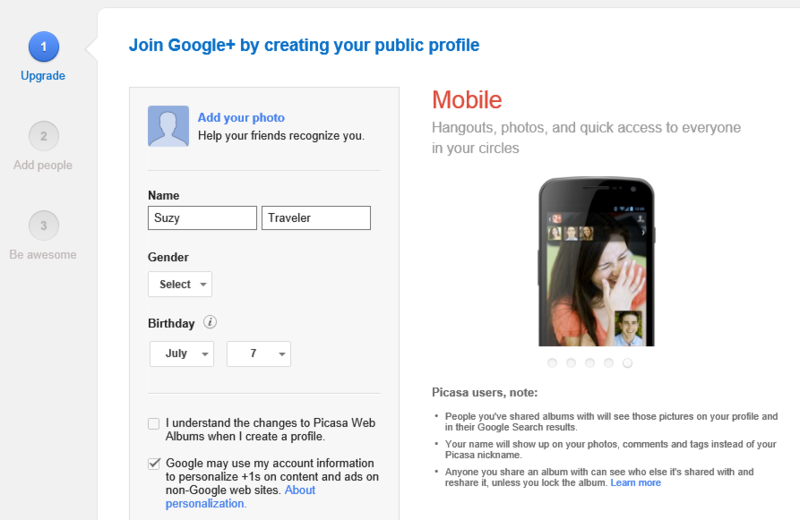 Just make sure your name is correct, add your gender, and birthday and you now have Google+ as part of your Google account. If you should decide you don’t like it, you can always remove the Google+ info from your profile – just make sure you don’t remove your whole account. Unlimited free online photo storage if you agree to limit your uploaded photos to 2048 pixels. That’s plenty big enough for sharing online, or even printing, and the resizing is handled automatically by Picasa on your computer. Automatic uploading of pictures from your phone or tablet and stored privately online for free. Just install the Google+ app on your phone or tablet. Ability to share with ‘circles’ of friends, in addition to the existing public, or private sharing. You can still share with link. Why not use Google+? Picasa Web Albums is still there, just use the link: https://picasaweb.google.com/lh/myphotos?noredirect=1 and you’ll be seeing the same albums using the Picasa Web Albums interface. You can do this with Picasa Web Albums as well, but it’s just nowhere near as obvious as in Google+ Photos. 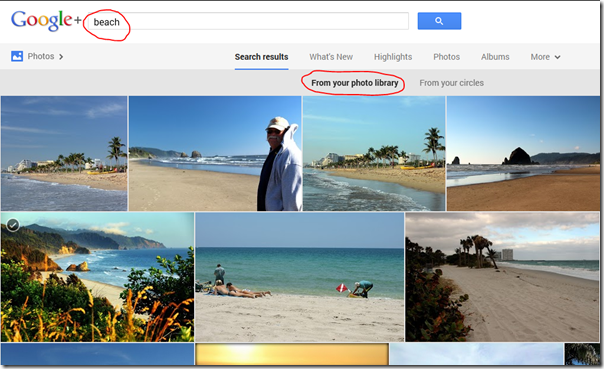 In Picasa Web Albums, when you search for ‘beach’ the default is to search all the public photos anywhere on Picasa Web Albums. In Google+ photos, the default is to search your own photo library. 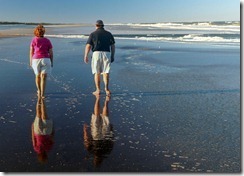 It picks up the word ‘beach’ in captions, tags, or album titles, just like Picasa on your computer. 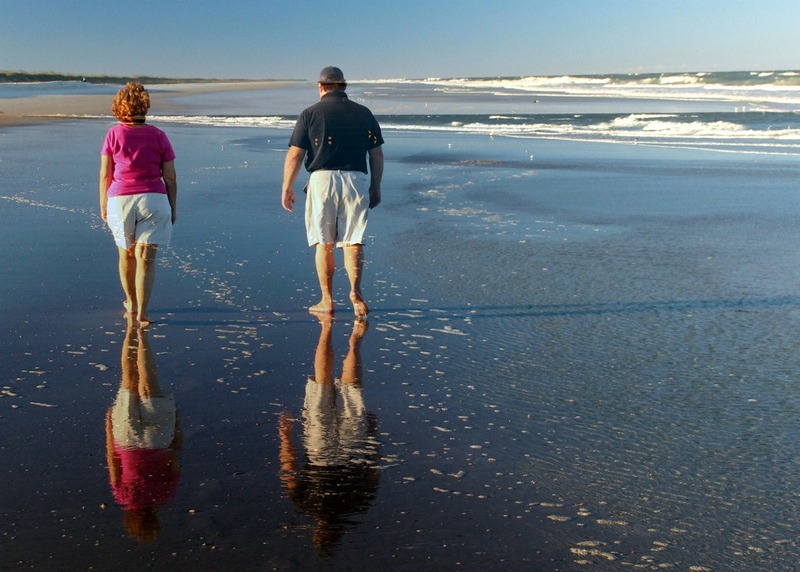 In the sample below, these beach pictures come from Oregon, Florida and Mexico – all from my Web Albums. Do you use Google+ Photos now? Are you avoiding it? Saturation: to make colorful pictures even more colorful.